The popular motif of children playing relate to the theme of 'One Hundred Children' which appears on a wide range of decorative objects, including porcelain, jade, textile and lacquerware. In Confucian philosophy, it was important for a family to have many children, but in particular many sons, to fulfill family and ancestral duties. The imagery of 'One Hundred Children' represents a desire for fertility, wealth and happiness. In Daoist thought, a child symbolises the innocence of a sage. 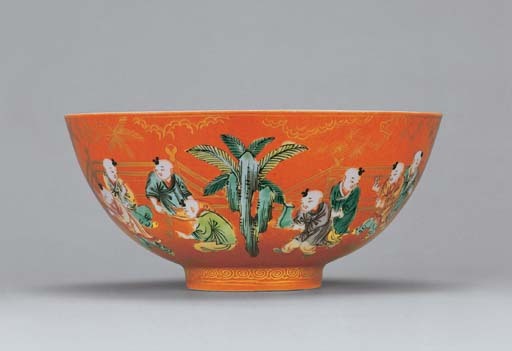 The elaborate and highly amusing design on the present bowl is based on earlier Ming prototypes of children gathered in groups playing in a landscaped garden. The earliest representation in this format can be found on a Yongle blue and white bowl exhibited at the Hong Kong Museum of Art, Chinese Porcelain, The S. C. Ko Tianminlou Collection, 1987, illustrated in the Catalogue, no. 15. It is uncertain whether these scenes were individually designed or inspired by woodblock prints, although it is known that paintings of children at play were prolific during the Southern Song period and popularised by the 12th-century court artist, Su Hanchen. There are numerous examples of this type of bowl with Jiaqing marks, while Kangxi and Qianlong-period bowls are much rarer. From the Kangxi period onwards, the design becomes quite standard with the same groupings of boys portrayed in very similar settings. Cf. a coral-ground bowl with a Kangxi mark, illustrated in The Tsui Museum of Art, Chinese Ceramics IV, Hong Kong, 1995, pl. 104. A pair of bowls of identical design from the Qianlong period is illustrated in Chinese Ceramics in the Idemitsu Collection, Japan, 1987, pl. 952. Jiaqing-period bowls are more popular. An example in the Palace Museum, Beijing, is illustrated op. cit, 1999, pl. 159; one was included in the O. C. S. Exhibition of Ch'ing Polychrome Porcelain, Hong Kong, 1977, Catalogue no. 100; one was exhibited at the Hong Kong Museum of Art, Wonders of the Potter's Palette, 1984, illustrated in the Catalogue, no. 93; another is illustrated by Gunhild Avitabile, From the Dragon's Treasure, Chinese Porcelain from the 19th and 20th Centuries in the Weishaupt Collection, London, 1987, fig. 32; and a pair was recently sold in our London Rooms, 17 June 2003, lot 56.